Despite the word T-shirt being in our name, we make quilts from all types of clothing and textiles. Each type is unique and fun. We have compiled a number of different types of quilts we can make here. If you don't see what you are looking for, let us know! We would love any challenge. Below is information about having a quilt made from many different types of items. Click on the type of quilt you are interested in. Back to: What can you use in a T-shirt quilt? What do you do with all those hankies that you inherited from you great aunt? They are pretty, but what do you do with them? We recently came across a group of hankies that we found at a garage sale that we decided to transform into a quilt. I brought the hankies into the shop and they went straight in to the washing machine. If they could not survive the washing machine, then they weren’t going into the quilt. Next we ironed them. Then we sorted them. There were just a few dark colored hankies and we decided not to use those in the quilt. We all decided that we are delighted with the invention of Kleenex and other facial tissues. It must have been gross to have to use one hankie all day. Icky. The next step was figure out how to make the quilt cool. We wanted to show off the hankies on our quilt in a way that was not static or boring. That meant we rejected just laying the hankies flat on a single standard size block. First, we began by playing with the hankies. We folded them. We picked them up and set them down. We sorted them by type. We refolded them. Our conclusion: each hankie has it’s own personality. So we looked at each one as an individual and folded, draped or left whole as dictated by the design and stains on each. We had long discussions about what color to use behind the hankies. My older employees wanted white fabric while the younger ones wanted colored fabric. I was making this quilt with a younger woman in mind, thus I chose the colored backings. I also thought that this would let the unique designs and settings of each hankie show up better against its background. Each hankie was folded or left whole and we found a great colored block to put behind it. Since we make T-shirt quilts, we used excess T-shirt material for the background color for each hankie. We tried to highlight the designs on the hankies by how we folded them. The folded hankies were then pinned onto the colored block of fabric. Each hankie was then sewn down onto its fabric block. Some of the hankies were sewn down more extensively while others were only partially sewn down. We generally used white and off-white thread to sew them down. After the hankies were sewn to their background block, we made the quilt exactly like we would any T-shirt quilt. Everyone liked the quilt, but some of the sewers here still complained about the colored backing blocks. They felt like the hankies were out of their element on the colorful blocks. They wished we had used white background blocks for the hankie, making a more grown up style quilt. So, I went to eBay and searched for “vintage hankie lots.” Plenty to choose from! 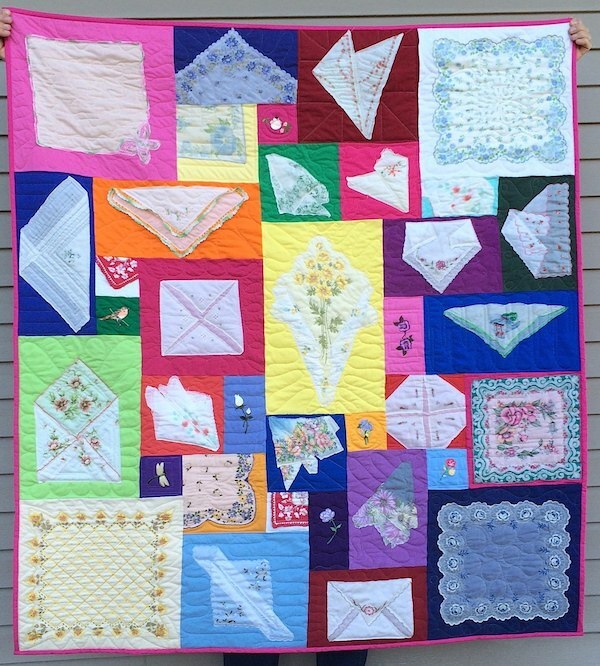 So I purchased two lots and we made another hankie quilt – this time with white background. We followed the same procedure – wash, iron, fold, pin, sew down and make into a quilt. These two quilts were made with the same procedure and turned out totally different! I still like the colored quilt better, but Dana and Barb love the white quilt. The white quilt feels more antique like. The quilt needs to be looked at up close because it’s more difficult to distinguish the individual hankies from a distance. I wouldn’t want to let this quilt be used much because it is white and it would get dirty easily. It looks more important. This might be a quilt to hang on a wall or use on a spare bed that does not get visited by a dog or cat. The colorful quilt is more approachable. I would use this quilt and enjoy the hankies. If I were making a hankie quilt for a young girl, this is how I would make it. I would sum up the differences between the two quilts as the white quilt is like your grandmother’s china, and the colorful quilt is like your day-to-day dishes. 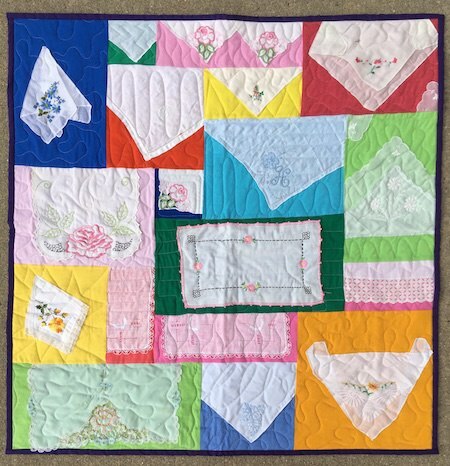 We can make a hankie quilt for you! We would want to know what color you would like for the background of the hankies. The cost hankie quilt is the cost of a T-shirt quilt of that size. There is an additional small fee per block to cover the extra work to sew each hankie onto the background material. To get started with us making your hankie quilt, click here to link to the direction page. 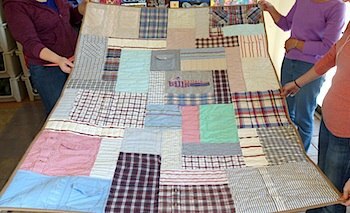 Discover more about having a quilt made with your T-shirts or other clothing items. 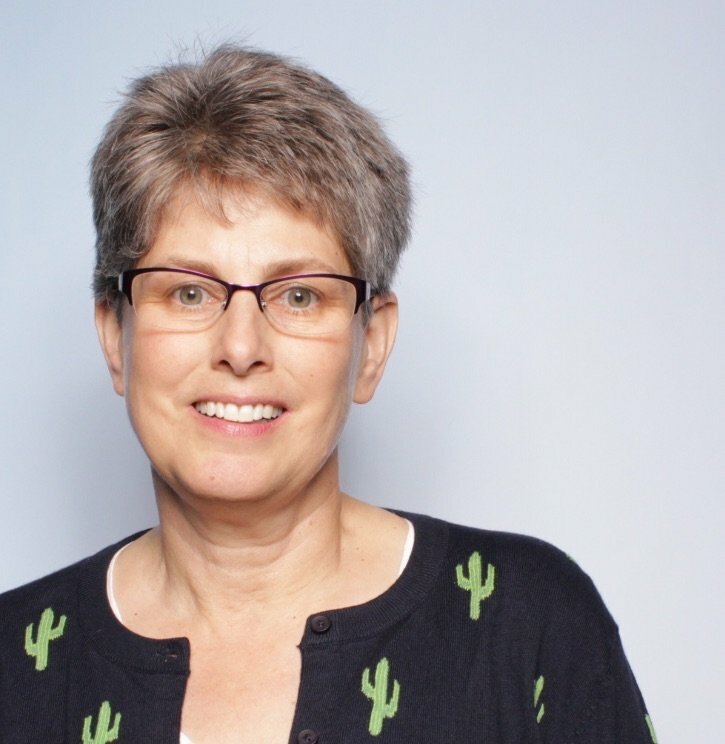 Our T-shirt Quilt Buyers Guide can help you know what you want your quilt to look like and what to look for in a quilt maker. The historical use of doilies and our cultural changes in grooming habits has a shared history. During the Victorian era, homes were being decorated with more stuffed furniture and decorative wooden tables. During this time period, our methods of cleaning were much different than they are today. This was in the time before vacuum cleaners. During this same era, our cultural norm on personal hygiene was also very different. This was the time of the once a week (at best) bath. Today, very few of us have gone an entire week without a bath. And if you have gone that long, you know what a week’s worth of BO smells like and what your hair feels like. So, you are a young man and you are going courting and want to look your best. What do you do? You wash you face and hands and use a product called Macassar Oil for your hair. This popular grooming product would keep your hair in place. Slicked back! Remember that Eddy Murphy movie “Coming to America”? In the movie, the boyfriend and his family made Soul Gel. When they visited, they left oil spots on the back of the couch. This is what Macassar Oil did to couches and chairs during the Victorian era. There wasn’t a cleaning solution to the Macassar Oil problem. The solution? The antimacassar, AKA the doily. Doilies were draped on the back and arms of fabric chairs and couches to protect the furniture from oils and dirt. The doily could either be laundered or replaced and the furniture kept clean. Doilies also were used to protect wood furniture from being nicked and scrapped from vases or other nick knacks. Doilies are typically crocheted in round patterns. They are a take off of crocheted lace – which was used to keep clothing clean from bodily oils. Today you are more likely to see paper doilies used in the presentation of cookies or other desserts. Our Too Cool T-shirt Quilt's® seamstress Dana Morales, who works in the Charlotte, Michigan location, made this doily quilt. Dana inherited doilies from her grandmothers, mother, in-laws and aunts. 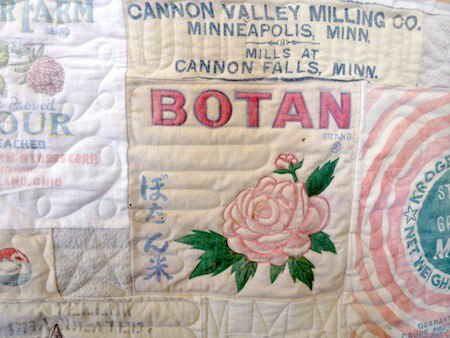 These important women in Dana’s life made many of the doilies that are in this quilt. Each doily has it’s own story and if you point to a particular doily, Dana can tell you the story. Dana plans on displaying the quilt on her bed and using it for napping. The quilt will be passed down to one of her two sons or to a future grandchild. 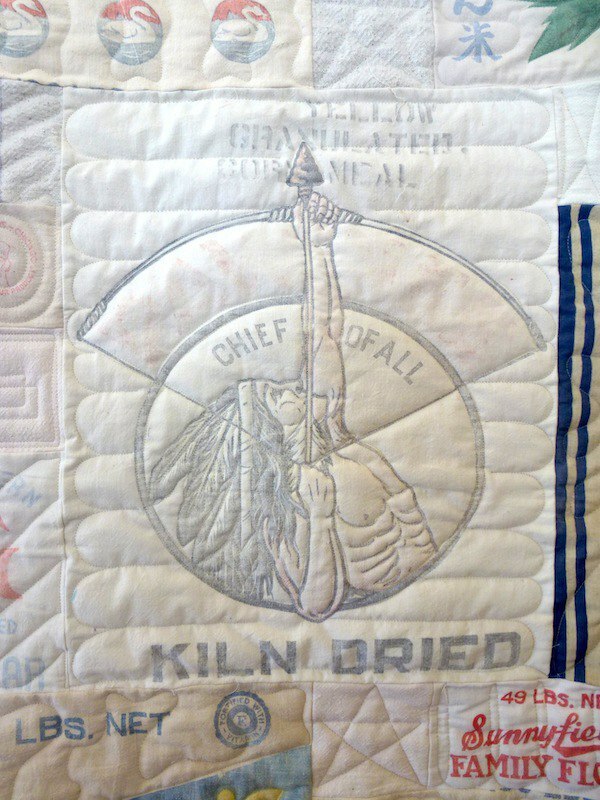 By sharing the stories of the women who made the doilies in this quilt with her sons and grandchildren, she will be keeping her family history alive for future generations. A quilt can do that. Doilies don’t come in one size! There are large ones, small ones and every size in between. 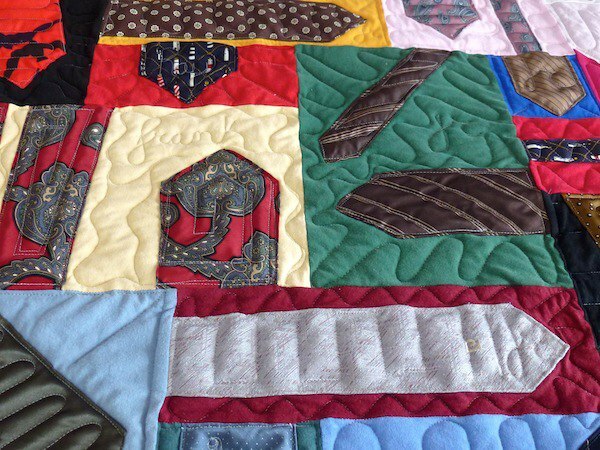 Thus, a quilt that can be made from many different size blocks works perfectly. 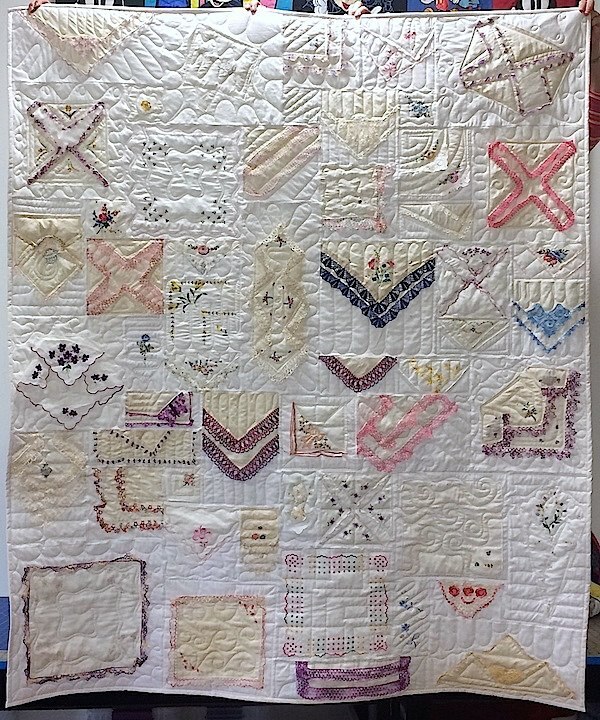 In this quilt, Dana used all white blocks for the background of each doily. She began by measuring each doily and determining what size backing-block it needed. Then she sewed each doily to the backing-block. And from there, it was made just like any of our other T-shirt quilts. Another option would have been to choose a different colored backing-block for each doily. That would have made a much different quilt. 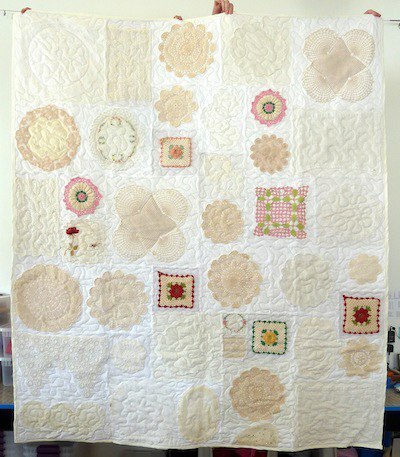 With the white backing, the quilt has a classic older feeling. If there were different colored blocks behind the doilies, the quilt would have had a much more modern feel to it. 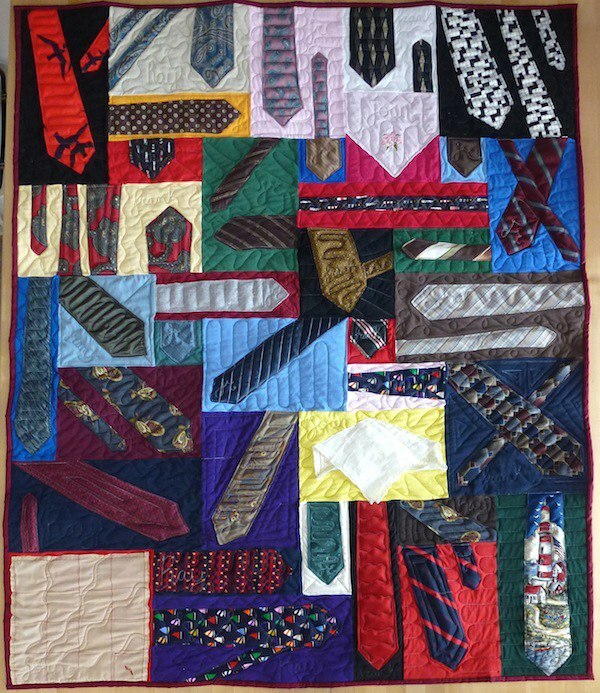 We have used neckties as part of T-shirt quilt, but we had never made an entire quilt with neckties. So when we had a customer ask us to make a quilt from neckties, I was intrigued with the challenge and excited with what my team and I could come up with. The necktie quilt we made far exceeded my expectations! I love the solution because it’s interactive and fun. First, all the blocks are puzzled together like our standard T-shirt quilts. Then each tie is given it’s own block and each is sewn down in its own unique way. 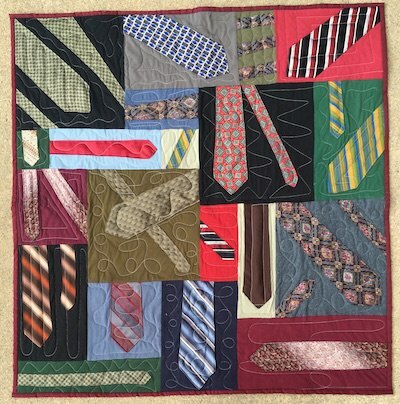 Below is the story our customer shared with us about how the necktie quilt came about. A couple years ago my brother-in-law passed away at the age of 55. A short time later his wife sent me a package containing some of his ties and a note stating that she would like his daughter Carine to have something to remember her father by. She thought that since I am so creative that I could think of something to do with them for her. Well I thought for a while and then remembered the two wonderful T-shirt quilts that Andrea made for me out of some of my mother's clothes. I contacted Andrea and told her I had 7 ties and she said that she could make a small pillow. After speaking with Andrea, I thought some more. I asked my father-in-law, Carine’s grandfather if he had any ties. He sent me 17. Getting into the spirit, my husband, Carine’s uncle, came up with 7 more ties. 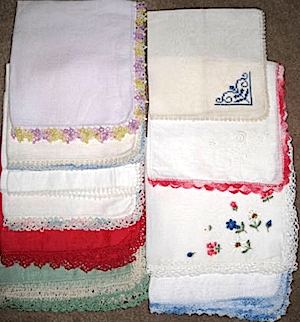 Then, I added in 3 of my mother-in-law’s (Carine’s grandmother) hankies. I had inherited these when she passed away. So with a total of 34 ties and 3 hankies, I got back in touch with Andrea to see what she thought. When I hung up I was so excited by her enthusiasm. I have just received the finished quilt and it has created a huge problem for me! I love it so much that it is going to be hard for me to part with it!!!! Andrea and her crew did such a wonderful job. The hankies, add a little bit of a feminine touch, especially the 3 dimensional one. The names on each item will remind her how much she is loved, by her father/grandfather/grandmother and uncle! Do you have neckties you are interested in turning into a quilt? If you like our approach, we would be happy to make a necktie quilt for you. 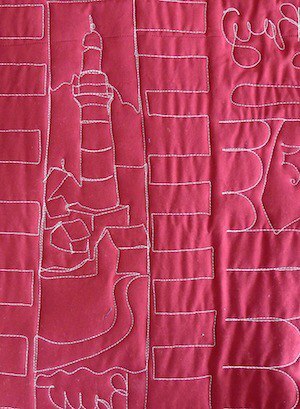 The intricate work that goes into a necktie quilt lengthens the time it take us make the quilt, thus the price is higher than it is for a traditional T-shirt quilt. If you would like more information, please feel free to e-mail us with your questions. The history of feed sacks is the story of the transportation of consumer goods. Consumer goods had been transported in wood barrels and boxes for centuries. By the mid 1850’s the southern US states were producing overabundance of cotton. Combine the excess cotton with advancements in sewing machine technology and you have the birth of the cotton feed sack. Cotton feed sacks replaced wooden boxes and barrows and the transportation of goods grew easier and lighter. At this same time, rural and poor families were struggling to make a living. The goods they consumed were now coming in cotton sacks. The cotton in the feed sacks became as valuable to them as the product in the sack. With nearly two yards of fabric in some sacks, the women of the era leaned how to reuse the cotton to make so many things their families needed. From towels to underwear, the cotton was repurposed. Companies manufacturing these bags quickly understood the secondary value of the feedbags. Initially they provided instructions right on the bags for whitening the bags – essentially removing the writing from the bags. 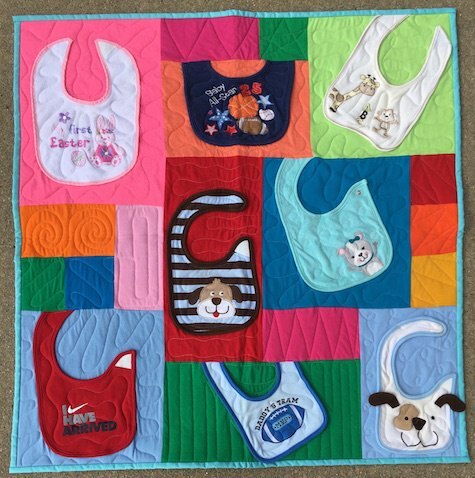 As reusing the cotton fabric from these bags grew in popularity, the manufacturers began printing on the bags fabric designs, doll patterns, embroidery patterns and other ways to use the bags. Manufacturers competed with each other to come up with something to add value to their bags so that the products in the bags would in turn be more desired. This is some early advertising branding. By the late 1940's most products shipped in either plastic or paper sacks. This ended the cloth feed sack era. I love antiques and my house has more antiques than I need... :-) Actually I have a "sickness" for collecting. And NO, I have not started a 12-step program. I started with collecting a couple of feed sacks because I liked the printed logo on the fabric. Initially, I was going to frame the sacks. However, I kept finding ones that I liked. Then I thought about having a quilt made from them and decided I could continue to collect them and not feel guilty. See...the sickness is back!!! I found most of the feed sacks at flea markets where the prices were very reasonable which also helped feed my sickness. :-) So once I found the Too Cool T-shirt Quilts website, the quilt came to fruition and it is wonderful! 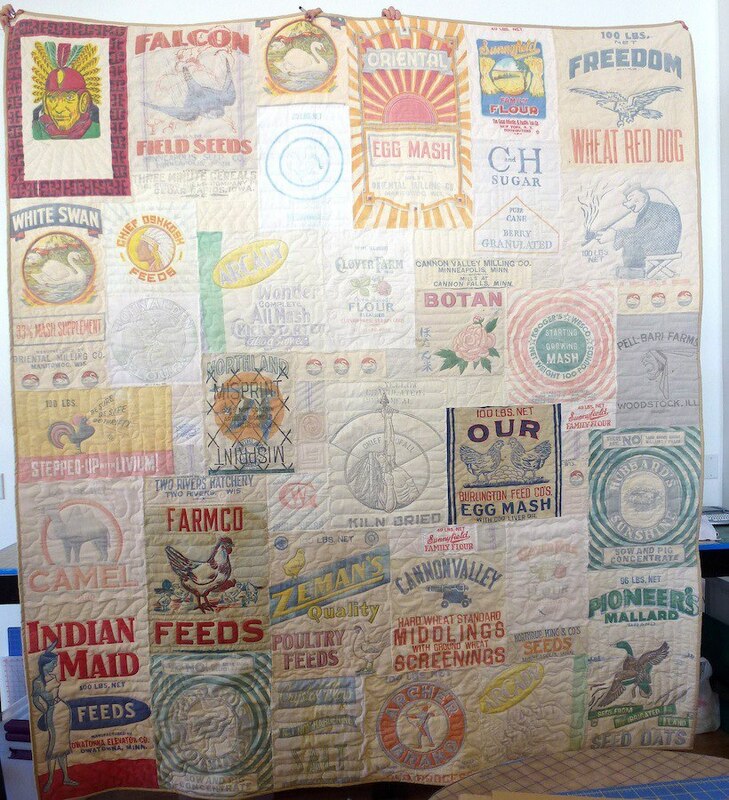 M arilyn’s quilt is made from advertising feedsacks. These bags came in all different sizes so our T-shirt quilt method that using all different size blocks was a perfect solution for this quilt. It allowed us to combine very large and very small sacks into a cohesive quilt top. The imagery on the sacks is very interesting. The sacks feature many different animals – falcons, eagles, swans, ducks, chickens and camels. There is also Native American and Chinese figures on the sacks. The feed sacks are old and the printing on many of the sacks is very faded. This gave us a challenge when choosing a backing material color. Any colored fabric we put next to the quilt top was just too bright. We choose a faded blue jean colored fabric for the backing. It looked as faded as the feed sack. If you like this quilt, start collecting advertising feed sacks yourself. There are some of us out there that just love our plaid shirts. Whether they are flannel, heavy cotton or dress shirts, if they are plaid, they are what we wear. When they start to wear out, we get new ones. But we never get rid of the old ones. After a while, you are over run with plaid shirts. What now? Place the shirts in a Rubber Maid tote in the attic, garage or basement for someone else to find when you die. Do you love your plaid so much that you can’t stomach anything except to store them away? If so, you are a perfect candidate for a plaid shirt quilt. 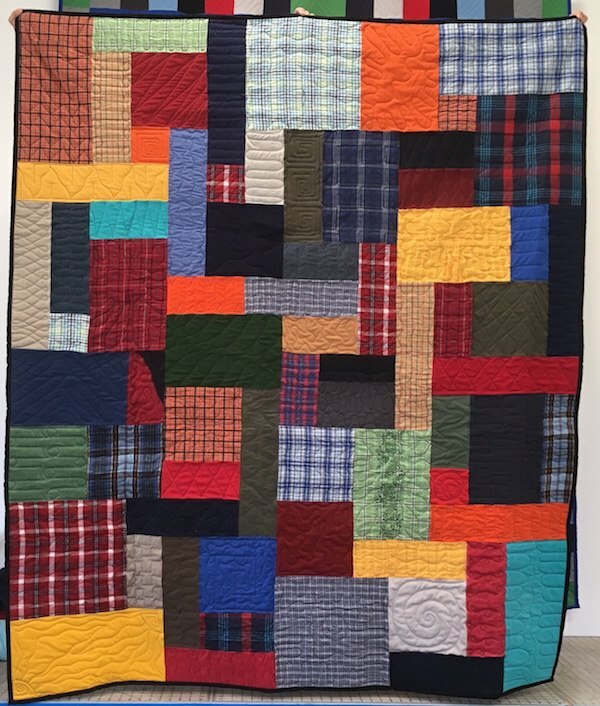 A plaid shirt quilt is made entirely from plaid shirts or made with plaid shirts mixed with some type of solid material. These quilts are fully quilted with a unique pattern on each block. 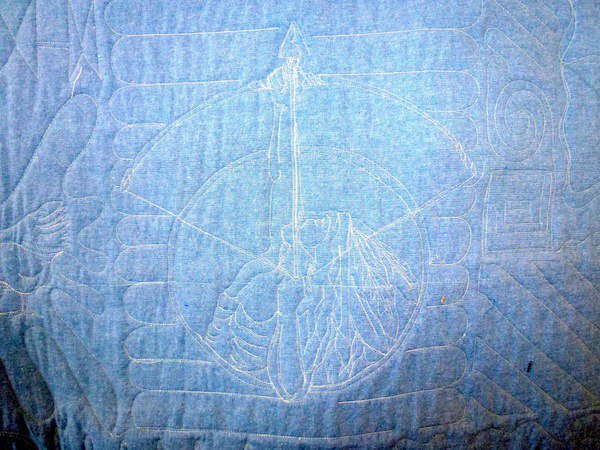 You can see the quilting designs on the back of the quilt. 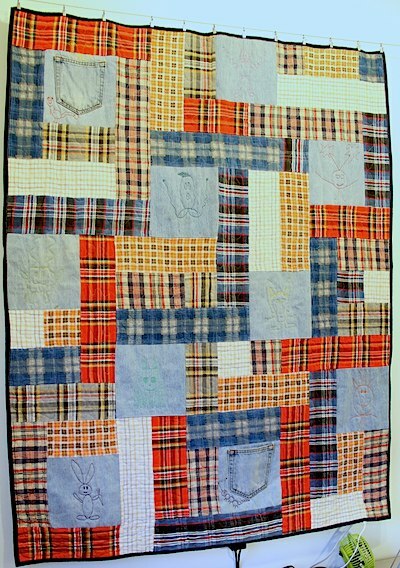 Best of all, with a plaid quilt you can wear all your plaid shirts at one time. Choose any number of plaid shirts and combine them into one quilt. Plaids are visually busy. To make this less apparent, choose shirts with different plaid densities and colors. So choose a range of plaid sizes from large to very small. The small plaids will read almost solid from a distance and provide your eye a resting place. Choosing a variety of colors will make a more dynamic feeling quilt. For some, there is nothing better than a flannel plaid shirt paired with a favorite pair of blue jeans. It’s their uniform of choice. You can translate that pairing in a quilt. Choose eight to ten shirts and a couple of pairs of worn and faded blue jeans. 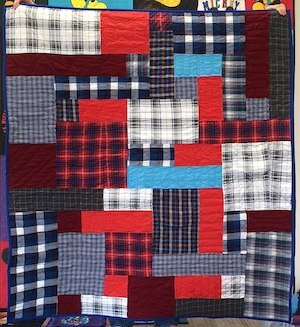 When a quilt is made, blocks of blue jeans are intermixed with the plaid shirts. Makes for a soft and comforting quilt. Do you prefer to pair your plaid shirts with a solid colored T-shirt? If so, you can also do this in your quilt. Choose three to five solid colored T-shirts and eight to ten plaid shirts that match. A plaid shirt does not necessarily have to be flannel, it can also be a cotton dress shirt. You could combine those plaid shirts with other solid dress shirts for a great looking quilt. Another option would be to combine the dress shirts with cotton khakis or dark colored pants. When choosing to make a quilt with dress shirts and pants, it’s important to make sure all the fabrics you choose are machine washable. If one item has to be dry-cleaned, then the entire quilt will also need to be dry-cleaned. Whatever combination you choose, take all your clothing items out and lay them on the floor or bed. Then stand back and squint at them. Do they all work together? If there are one or two items that stand out like a sore thumb, remove those items and look at the grouping again. Play with your choices until you have a combination you love. Flannel shirts, dress shirts and even blue jeans all have pockets that can be incorporated into the quilt. Pockets add a fun element to a quilt; so don’t be afraid to use them in your quilt. Plaid shirts have so much usable fabric that you could easily have more than one quilt made from the same grouping of shirts. This might be helpful if you are making memorial quilts from a Rubber Maid tote you found in the attic, garage or basement after your loved one died. Did you grow up playing with dolls? I did! I loved my Sasha dolls. They were beautiful 16" dolls first produced in Germany in the late 1960’s. Read more about Sasha dolls here. I probably played with my dolls later in childhood than most girls because I loved making clothes for my doll. My mom made clothing for the family and I imitated by making doll clothes. Honestly, it is where my love of sewing came from. But now what? I still have my dolls and all their clothing. Sasha is on display but her clothing is doing nothing. So being in the quilt business I decided I would make a doll clothes quilt. 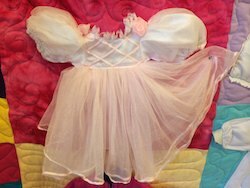 But I wanted to test this idea out on doll clothes that were not special before I made one with my own doll’s clothing. To get the necessary doll clothing, I watched at garage sales throughout the summer and purchased enough doll clothing to make a small quilt. I was surprised at how few doll clothes I found at garage sales. I think that many women, who like me, played with dolls have kept their doll clothing. After all, a girl’s dolls are their first family and you just can’t give that away. With this experimental quilt I first decided that I wanted it to be bright and fun! Why make it somber? Playing should be fun, so we chose fun colors. We repeated these colors throughout the border, which helped emphasize the color theme. We used pink backing and binding for this quilt because 98% of girls love pink. Second, I wanted the items used in the quilt to be interactive. This means I wanted zippers to zip, ties to be able to be tied, and snaps, clasps and buttons to be functional. We also left some of the skirts of the dresses free. This added texture and dimension. Wall Hanging - We are currently using this quilt as a wall hanging in one of our sewing rooms. The colorful quilt just wakes up the small room. If you have this quilt made as an adult, you might choose to use it as a wall hanging. This would make a great wall cover for a girl’s room. Bed Cover – A quilt like this can easily be used on a bed. 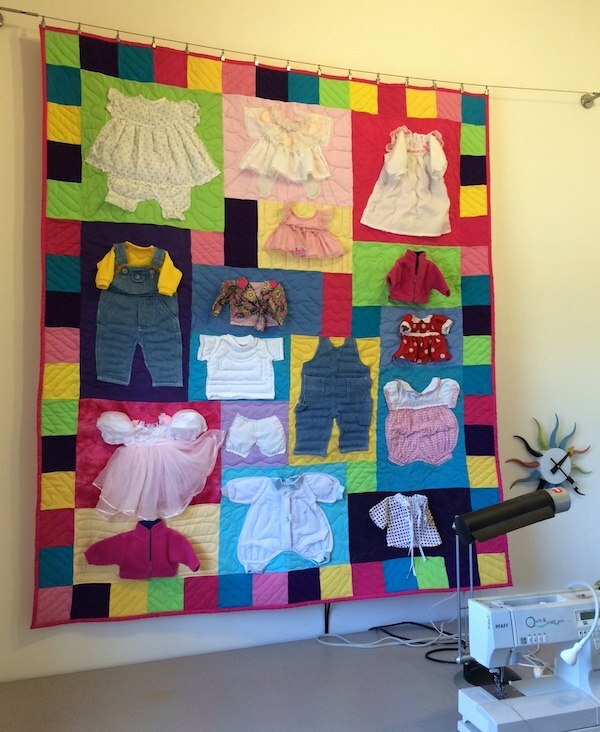 As long as the doll clothes used in the quilt are machine washable, then the entire quilt will be machine washable. I can see making a twin-size quilt from doll clothing for the bed of a young girl. 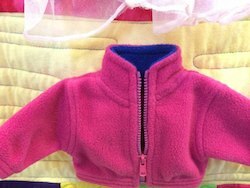 Throw – A doll clothes blanket would also make a fun throw because of all the texture and how interactive the clothes are. It would give your fingers something to absently play with while you are watching TV. “Crawling Pad” - We are finding that more and more grandmothers want a blanket to put on the floor for a grandbaby to lay and crawl on. 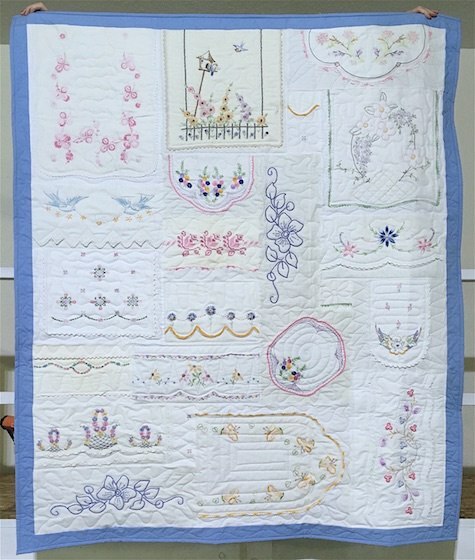 The texture and the interactive components of this quilt make it an ideal candidate for a baby girl. Collect your old doll clothing. If you have a highly collectable doll like my Sasha Doll, I would suggest not including the outfit the doll came with. This should remain with the doll. Wash the clothing to clean the years of handling and any mustiness from having been stored for a while. Print out the order form. Be sure to tell us what color scheme you would like. For example, colorful, all white, all black, colors popular from the vintage of the doll or all the blocks from one color family. Have fun with this! Note: doll clothes quilts are priced the same as a baby clothes quilts. Box up the clothing, include the order form and ship it off. We will let you know when your items arrive. We are more than happy to answer any questions you might have about making a doll clothes or any other type of clothing based quilt. Feel free to call or write. When my daughter Milie was a baby, we went through four to five bibs a day. She was a typical baby – a very messy eater! We had both everyday and special occasion bibs. We were given bibs for gifts and at holidays. Who knew one baby needed so many bibs! As Milie grew, we used bibs less and less until she finally got the hang of eating. Her bibs took a beating: from food and from repeated washings. But I couldn’t just give them away – I am a little too sentimental. I packed the bibs away with her other baby memorabilia and mementos. Recently, I cleaned out a storage room at the house and rediscovered that stack of bibs. 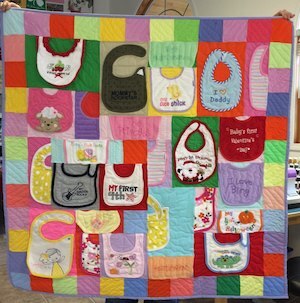 Throughout the past 10 years we have been making quilts from baby clothing. These quilts included plenty of bibs. I always liked the bibs in the quilts. So I decided to make an all bib quilt from Milie’s bibs. But with any new type of quilt we make, we made a test quilt first to make sure that the quilt turned out as cute as I imagined. So we made our first quilt using bibs we found at garage sales. We could have made a quilt with uniformed sized blocks with the bibs each centered on its block, but that method would be way to static and simplistic for my likes. So, of course, we used the Too Cool T-shirt quilt method of puzzling together multiple size blocks. If the bib was clean and had an interesting graphic, we may have centered it. Other bibs we cut in half and used them on two separate blocks. 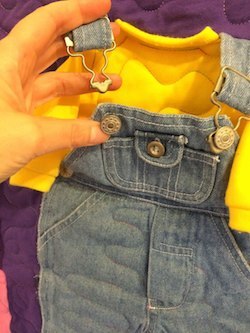 We thought this might be fun for a child to have to hunt for the other half of the bib. On a number of bibs, we left the Velcro and snaps functional. Also a great play thing for a young child. A few of the bibs were kind of grungy so we only used part of those bibs. We left a number of reversible bibs unattached to its block. 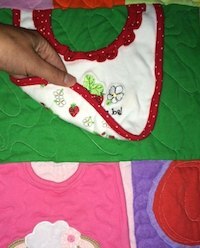 The bib was simply sewn in the top seam. This allowed the bib to be flipped up to see the underside of the bib. New and used bibs don’t cost a lot so it would be reasonable for either you to collect bibs or have friends and family each donate a bib. As babies begin playing on the floor, you put a blanket on the floor for them to crawl on. This blanket would be perfect for that since it is colorful and has a lot of different texture. There are also snaps and Velcro for the baby to play with. We are going to take this quilt and hang it in the kitchen at our Charlotte, Michigan location. It’s a perfect symbol of eating! Sure, this baby bib quilt is a cute quilt and all. But it might not give you the warm and fuzzies. After all, the bibs don’t hold any meaning to you. Now, imagine this quilt made from your child’s bibs. That brings back a lot of memories and makes it a quilt to treasure.